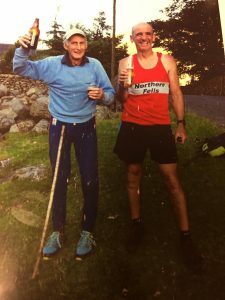 A huge thank you to the Clarkson family, who have been fundraising for Fix the Fells in memory of the late Paul Clarkson. David Clarkson (pictured above with Joss Naylor) completed the Joss Naylor Lakeland Challenge in 16hrs and 22 mins in memory of his brother, raising £210 for Fix the Fells. Previously Christine Clarkson (Paul’s wife) and her 8-year-old daughter Lily completed the coast to coast cycle ride for Fix the Fells, describing the challenge as a “great team effort”. Everyone at Fix the Fells is truly grateful for your fundraising endeavours.